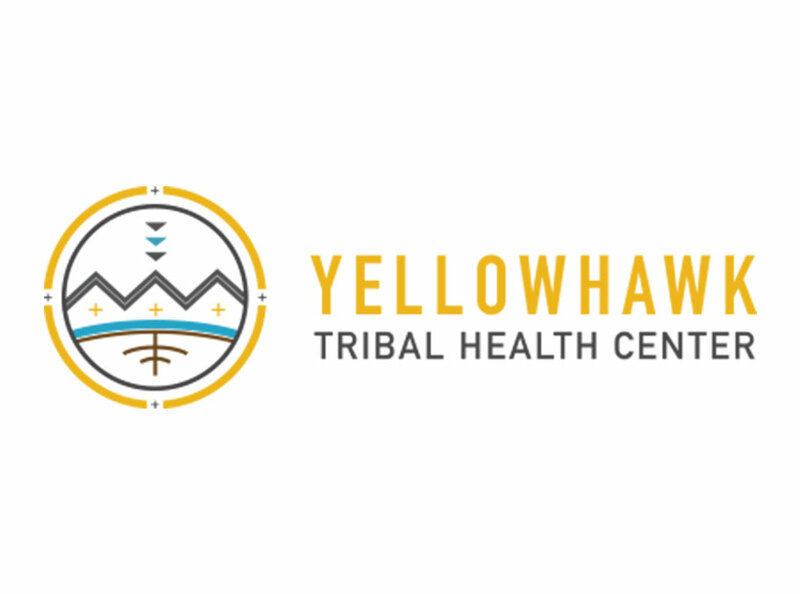 MISSION, OREGON – Yellowhawk Tribal Health Center has unveiled a new logo in preparation for its new clinic which is set to open in the Fall of 2017. The graphic artist, Victor Pascual is Navajo (Dine), and owns and operates Digital Navajo in Albuquerque, New Mexico. As part of his research for the design process, Pascual took historical documents, beadwork and basket designs to guide his creativity. In addition, he met with CTUIR tribal member, Thomas Morning Owl who shared with him the creation story of the Cayuse, Umatilla and Walla Walla Tribes. The new Yellowhawk logo depicts three (3) mountains, which represent the three tribes, a sloped terrain, the hills, root system, a river line, three (3) basket arrows and four (4) directions stars. Pascual also added the idea of the circle is trying to encapsulate the idea of centeredness, which could translate into the idea of wellbeing and connectedness of the people. “Reoccurring themes of nature, this idea of landscape, mountains within the creation story that Thomas shared was really what I was trying to achieve with this concept is taking a look at the bigger picture, the area in which the tribe is located and its direct connection to the people and applying that to a contemporary and clean design,” Pascual said. The current Yellowhawk logo is a hand drawn image by Lonnie Alexander who was a nurse at Yellowhawk for more than 20 years. The image is of three medicine wheels and three eagle feathers was drawn for a Yellowhawk event and eventually evolved into the official logo. Yellowhawk Tribal Health Center is owned and operated by the Confederated Tribes of the Umatilla Indian Reservation. It provides primary healthcare and additional services to more than 3,000 American Indian/Alaska Native patients. Yellowhawk Vision: Our Tribal community achieves optimal health through a culture of wellness. Yellowhawk Mission: It is our mission to empower our Tribal community with opportunities to learn and experience healthy lifestyles.